9th century China: 10-year-old general’s daughter Nie Yinniang is abducted by a nun who initiates her into the martial arts, transforming her into an exceptional assassin charged with eliminating cruel and corrupt local governors. One day, having failed in a task, she is sent back by her mistress to the land of her birth, with orders to kill the man to whom she was promised – a cousin who now leads the largest military region in North China. A slave to the orders of her mistress, Nie Yinniang must choose: sacrifice the man she loves or break forever with the sacred way of the righteous assassins. This is not a mainstream film many will know how to appreciate. Watching this film in the cinemas, there were a couple of people who walked out of the cinema, and the duo sitting beside me was looking at their phone 80% of the time instead of watching the film. I had to admit, I frowned at the opening 4:3 black and white sequence. That’s not how I thought a period film would be, it felt fake. But when the scene changes, I was blown away by the amazing scenery. The lakes, trees, forests and birds. It felt like a painting come alive. The dancers were dressed in light robes and the set was illuminated with beauty lights. Then I realised, I wasn’t watching a movie, I was watching the life of the people from the Tangs. There were many silent moments. The film was slow. The camera hardly moves. There were moments where I was tired of waiting, waiting to watch Nie Yinniang make her move as she stay hidden, eavesdropping most of the time. A long take of a spiralling smoke brought me back to the film. It was amazing how the Director made use of minimal special effects and in the most natural way to bring out witchcraft. It was then when I start to appreciate the scenes a little more. The fighting scenes were of 3S qualities – Swift, Short and Silent. This is very different from the usual period fighting dramas majority of us are used to watching. Initially, I was intrigued by the fight scenes. Then I was in awe. Isn’t this how the real fight scenes should be? Who will warn the opponent with their shouts? In the film, Yinniang’s skills were so good that she didn’t even have to defeat her opponents. A smart opponent will know that they’ve lost without her going for the kill. One of the best part came from this eye-candy Tsumabuki Satoshi who acted as mirror-polisher. The final moment when Nie Yinniang (Shu Qi) decided to join him to travel around the world, the happiness in this simple man’s steps and the smile Nie Yinniang gave him (the only smile she had in the film), it felt like that was all it matters in the end. While I’m impressed with the Director’s work, I had to admit that this is definitely not a crowd-pleasing film. Watch it with an open mind, observe the details and you might learn to appreciate it a little more. Taiwanese director Hou Hsiao-Hsien won the Cannes Best Director Award with this film. It is also the taiwanese entry for the Best Foreign Language Film at the 88th Academy Awards In order to pursue perfection, Director Hou forgo many scenes which he had filmed, and even refilm certain scenes after some time. There was a scene where Chang Chen was sitting down, when the Director reviewed the scene after some time and found it off, he got the crew to rebuilt the whole set and re-film it. A scene featuring Chang Chen and Nikki Hsin-Ying Hsieh by the bed wasalso refilmed after half a year when editing started. A film that took 2 years to film. The director filmed this movie like filming a documentary. Shu Qi revealed how amazing she felt to have to act a character for so long. Besides having acrophobia, Shu Qi said that she was not good with martial arts and had a heard time trying to find the agility and behaviour of a martial arts expert. The director also want her to use 9 lines to act out this role. Check out The Assassin (刺客聶隱娘)Official Website and Facebook Page! 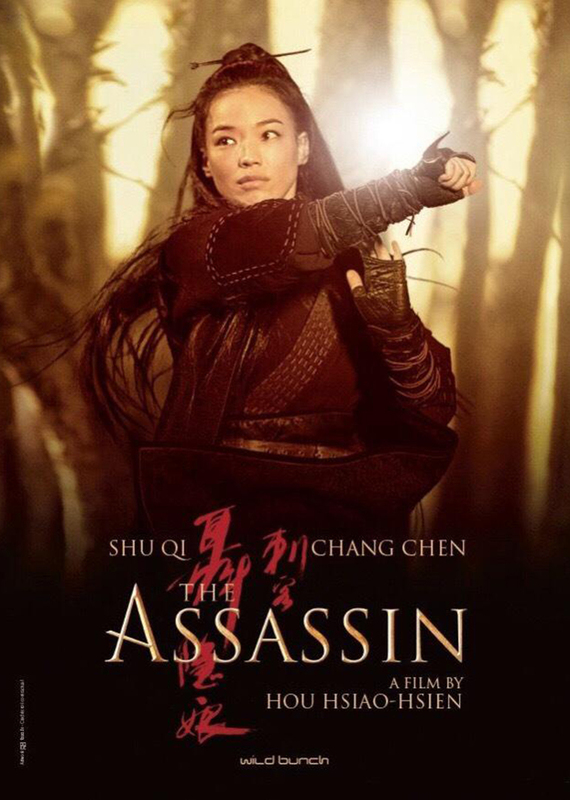 The Assassin (刺客聶隱娘) is out in cinemas on 10 September 2015. Just 3/5? I think my boyf wanted to catch this he other day, but we ended up with 我的少女时代 instead. haha! Have u done a review on that? I already watched this movie and it needs focus for the story to really understand the plot. Moreover, I like the mirror-polisher man doing his role. Cinematography looks interesting. The plot seems something that will be patronized by movie-goers. When I was a kid,any oriental movies particularly depicting family tragedies with display of martial arts were my favorites. Though I didn’t understand the dialogue. Now there is a subtitle for every dialogue making it easy to follow up the entire movie show. It has been a while since I last watched Shu Qi movie, when it screen in Malaysia I will watch this movie. Very interesting. I’m definitely going to check out this movie. The costumes and sets are gorgeous! It’s really challenging to come up with a good period film. It does looks exciting to see the scenery here. Hmm. I really like Chinese period movies, but the pacing of this one might make me walk out too. But having read about the meticulous director, that might have just changed my mind. It sounds like a good movie with a nice script. Would love to catch this movie in theatre. I love movies like this! anything that takes me back to the past is interesting to me! With the plot and the time in history, I think this movie will be loved by my grandparents. The actress is popular and we watched her many films before. Sound like a really cool movie to watch. I love that the main actress looks soo pretty! I love movies that have an “old” setting. It brings you back in time not only to enjoy a story from the past but also how they dressed, ate, lived. It’s all so nice.